There is very little in the scientific literature that spells out the connection between depression, drug addiction and hypoglycemia. The reason seems to be that the ‘hypoglycemia’ is as yet not recognized by mainstream medicine as a classifiable illness, despite the fact that many health practitioners agree that it is the forerunner of diabetes. It is difficult to investigate a non-existent disease. The term ‘hypoglycemia’ does not show up in any search of Medline, except when mentioned in connection with diabetes. Another reason is that the term ‘hypoglycemia’ is a misnomer and is bound to confuse many medical practitioners who understand the term to mean quite correctly “low blood glucose levels”. A more appropriate term would have been ‘dysglycemia’, indicating unstable blood glucose concentrations often seen in a Glucose Tolerance Test of people having ‘hypoglycemic’ symptoms. Again ‘dysglycemia’ does not show up in any Medline search. Because early literature on hypoglycemia concentrated on the ‘low’ levels of blood sugar as the cause of symptoms, the expression has stuck as ‘hypoglycemia’. The third reason may well be that over the last fifty years medical research has been dominated by commercial corporations – such as international pharmaceutical companies, instead of independent universities – driven by motives of profits and answerable only to investors, instead of community interests. Hypoglycemia can be treated by dietary and lifestyle changes, thus attracting little attention to commercial corporations and their clients. Some scientists believe that sugar addiction (sucrophilia) is due to an error in the metabolism of serotonin. Scientists have noticed that many drug addicts have a history of sugar addiction (Burton, 485-488) and they believe that this is due to a dysfunction in serotonin synthesis. Teenage depression is also due to this defect and could be responsible for the development of addiction. Thus we need to look at brain chemistry. A neurotransmitter is a chemical substance produced by the body that bridges the gap between one neuron (nerve cell) and another. Tiny electrical currents are transmitted from one neuron to another via a gap or ‘synapse’ when it is occupied by a specific neurotransmitter. It is at this junction which permits the triggering of electric current in the next cell depending on the neurotransmitter at the synapse. Thus neurotransmitters may be seen as some sort of regulators. Neurotransmitters are stored in the nerve cells’ ‘vesicles’ and are released from these cells. They lock on to special receptors of the next nerve cells, very much like a key fitting into a lock. Each receptor is unique to a neurotransmitter. There are many neurotransmitters but let us concentrate on serotonin. Serotonin – also known as 5-hydroxytryptamine – is a compound widely distributed in tissues, particularly in blood platelets, intestinal wall and the central nervous system.2As a brain neurotransmitter it helps us to relax, enjoy life and promotes sleeping (when it is converted to another neurotransmitter called melatonin released by the pituitary gland during darkness). Serotonin is produced from an essential amino acid called tryptophan. Soya, brown rice, cottage cheese, fish, beef, liver, lamb, peanuts, milk and bananas are rich in tryptophan. If you would like to find out more about sources of nutrients please look up the file “Rich Sources of Nutrients” under “articles”. The metabolic processes in the body are driven along by enzymes (or catalysts) – themselves proteins – converting one substance to another without altering the enzymes themselves. These operate with co-enzymes, such as vitamins and minerals, without which these enzymes cannot function efficiently. Vitamin B6 (Pyridoxine) is required to convert tryptophan into serotonin. Additional magnesium also helps. Thus when we have a vitamin B6 deficiency – often the case with people who have high levels of toxins in their body – then tryptophan is not converted to serotonin 4. Some signs are depression and insomnia.5 Tryptophan can also be converted to vitamin B3 (niacin) under the influence of B6 (pyridoxine). This takes precedence over serotonin production.6 This could explain why in some cases of mental illness vitamin B3 supplementation has improved the condition. 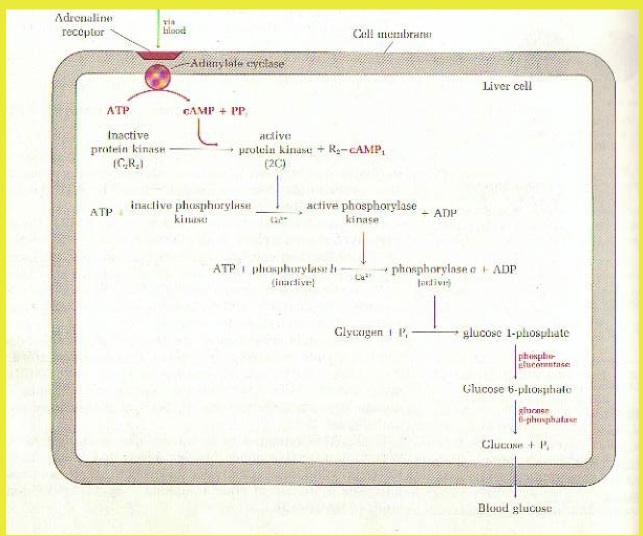 The absorption of amino acids follows a pecking order; the absorption of phenylalanine (an other essential amino acids and we will come back to this later) comes before the absorption of tryptophan. They compete with one another for absorption. One way to speed up the absorption of tryptophan is by consuming refined carbohydrates – such as sugar. Sugar consumption triggers the body to produce insulin, a hormone that transports glucose, amino acids and fatty acids into cells. Thus high levels of insulin absorb amino acids (as well as glucose) and make room for the absorption of tryptophan.7 This is then converted to serotonin in the presence of vitamin B6 and presto we feel happy!!! This may lead to sugar addiction and here is theory connecting hypoglycemia and addiction. “Sucrophilia” or love of sugar is one of the symptoms of hypoglycemia. The question remains how this can lead to other forms of addictions such as addiction to heroin or cocaine. Sugar addiction leads eventually to insulin resistance. When the body is exposed to excess insulin over a long period of time, it adapts by ‘down-regulating’ receptors for this hormone. This means reducing insulin receptors in target cells. Insulin Resistance is an abnormal response of the cells’ receptors to insulin. Both hypoglycemia and diabetes are affected by ‘insulin resistance’. In diabetes insulin resistance results in hyperglycaemia, responsible for increase in atherosclerosis, changes in the retina of the eye and cataract, changes in kidney which lead to protein excretion via the urine8, damage to nervous system, particularly of the legs producing tingling and numbness. The main reason why the body fails to produce the right amounts of neurotransmitters and hormones, is that the conversion of nutrients into feel-good neurochemical require biological energy called adenosinetriphosphate (ATP). The brain is especially dependent on ATP, and a brain starvation of energy will immediately trigger the release of stress hormones, such as adrenaline and cortisol. Adrenaline functions to convert sugar stores in the body – glyccogen – into glucose so as to feed the brain again with energy. (Image). But these very stress hormones coming from within are also responsible for he various symptoms of “mental illness”. Thus people may have learned that depressant drugs – particularly alcohol and tranquilisers – can calm down nerves as a result of excess stress hormones, and here we have another mechanism for addiction to depressant drugs, a a result of hypoglycemia! Insulin Resistance may block phenylalanine? But there is another important theory that may explain the heroin/cocaine addiction. Hyperinsulinism means that other amino acids are blocked for absorption. Thus it could well be that phenylalanine – an other essential amino acid – is not properly absorbed, because of insulin resistance. Phenylalanine is the forerunner of a series of neurotransmitters – called catecholamines – among these the important neurotransmitter ‘dopamine’. Dopamine is the main neurotransmitter responsible for the highs that drug addicts experience when injecting with heroin, or taking cocaine. Special brain cells produce dopamine (from a long series of biochemical conversions deriving from phenylalanine), a neurotransmitter responsible for feelings of pleasure. Normally dopamine is reabsorbed by the dopamine cell for reuse. It is known that heroine and cocaine occupy these receptors for dopamine so that reuptake of dopamine is prevented. This results in an excess of dopamine, which drug addicts experience as a high. However, the brain – in other words target cells responding to dopamine – respond by down-regulating receptors as a defence against excess dopamine. Thus down-regulation of receptors is the mechanism whereby ‘tolerance’ is build up. More of the substance – heroin or cocaine – is required to experience the high! Consequently, the body has to rely on drugs in order to obtain sufficient levels of dopamine for a person to function at all. Another set of brain cells, namely GABA (gamma-amino-butyric-acid) cells, regulate the production of dopamine in dopamine cells. GABA is an inhibitory neurotransmitter that sends messages to dopamine cells and controls the amount of dopamine these cells produce. Thus it exerts influence over the dose of dopamine release. What may be useful to know at this stage is, that GABA is produced from glutamine (a non-essential amino acid) and converted to GABA in the presence of vitamin B6. (Chaitow, 79) A supplement of glutamine (easily converted to glutamic acid 9) is now available from health food stores. Glutamine has been successfully used in stopping alcohol and sugar craving and may be helpful in the treatment of other drug addictions. The question is whether drug addiction is primarily due to an error in serotonin synthesis or results from hypoglycemia? This question is similar to the nature-nurture debate in psychology. We have seen that we could reason that a blockage of serotonin production, would lead to depression, to sugar addiction, which in turn leads to insulin resistance, diabetes and/or drug addiction. No doubt there are genetic factors operating that predispose us towards either or all of these conditions. If we accept the serotonin hypothesis, being seen primarily as an inherited condition, then we would come to a dead end. This would be a form of biological determinism, presenting us with an inevitable outcome of our congenital destiny – a rather pessimistic point of view. If on the other hand we were to accept that hypoglycemia, a lifestyle condition, precedes or aggravates an inherited weak link in serotonin metabolism, then this would open the way to new treatments and interventions for either depression, hypoglycemia, diabetes or drug addiction. The serotonin hypothesis would suggest that it is a mere coincidence that in the twentieth century humans have been increasing their sugar consumption on average 15 lbs per head per year in 1900 to 120 lbs per head per year in 1974. (Cheraskin, 8) In the year 2001 this figure would be much higher! Furthermore, humans are now exposed to 65,000 xenobiotic (often poisonous) chemicals produced in the USA alone (1000 chemicals added each year) and dumped in the environment and undermining our health. As a result of modern agricultural practice in the USA trace mineral deficiencies in the soil were reported in all fifty states, zinc deficiency in 32 states. This means that an important co-enzyme like zinc may be in short supply in the diet – 80 enzymes are known to require zinc as a co-enzyme. It is no coincidence that alcoholics or anorectic patients are known to be zinc deficient. The evidence of drastic environmental changes during the last few decades, which would decisively affect our health, cannot be ignored. It would be more reasonable to assume that the nutritional environment of modern humans plays a more significant role in the pandemic of mental illness, hypoglycemia, diabetes and drug addiction. The inherited error of serotonin metabolism appears to be of secondary importance. Most modalities in the treatment of drug addiction start with detoxification. This is probably the most difficult step in treatment. Not only that, but staying off is even more difficult. The reason is clear that the brain has adapted to the use of high levels of dopamine, artificially increased by drugs and resulting in a reduction of receptors for dopamine (and perhaps other neurotransmitters). It will take some time for the brain to readapt (that is build receptors) for the neurotransmitters now synthesized naturally. Thus to expect that the natural production of neurotransmitters (for instance dopamine) will find adequate receptors – now reduced by drug use – may indeed be a tall order. This scenario applies equally to the prescription of Selective Serotonin Reuptake Inhibitors (SSRIs) by doctors for the treatment of depression. These, like street drugs, block the reabsorption of a neurotransmitter, serotonin. Long term use may alter the brain structure – down regulates receptors for serotonin. Hence withdrawal often results in rebound depression. You can only withdraw from these drugs gradually and under the supervision of the doctor. If this is so, why not the same for street drugs? I am just wondering in the light of the above knowledge, whether it would be possible for drug addicts to eventually reach a point, where drugs are not needed, if and when they would treat the underlying causes of drug addiction. This could be achieved by adopting hypoglycemic diet, take suitable vitamins and minerals 11 , and neurotransmitter supplements such as tryptophan, phenylalanine and glutamine UNDER THE SUPERVISION of a doctor or drug counsellor (phenylalanine may have adverse effects in some people). This suggests a reversal in the official treatment process, deal with underlying causes first, before withdrawing from drugs. This may be a radical view, especially because there appear to be no studies to support this hypothesis. Many more studies will be required to clarify some of the points raised here. It is expected that clinical nutritionists will contribute further to this research. As we have noted the sequence leading to addiction following the error in serotonin synthesis may be triggered by a long period of emotional stress responsible for the imbalance in brain chemicals. Therefore, it cannot be stressed enough, that this regime should be accompanied with a course in psychotherapy or Rational Cognitive Behaviour Therapy (RCBT), which will help a person to deal with the normal stresses of life. Drug addicts – and for that matter others suffering from a mental disorder – have a severely damaged self image which affects their personality at the core. This can be remedied by doing a course in psychotherapy. Such a self-help course is freely available at this web site at PSYCHOTHERAPY. Chaitow,L(1985), AMINO ACIDS IN THERAPY, Thorsons Pub. Inc N.Y.
Wade, C (1985), AMINO ACIDS BOOK, Keats Pub Inc, New Canaan, Conn.
1 ) Strickland PL, Deakin JF, Percival C, Dixon J, Gater RA, Goldberg DP. Bio-social origins of depression in the community. Interactions between social adversity, cortisol and serotonin neurotransmission. Br J Psychiatry. 2002 Feb;180:168-73. 2 ) The sudden contraction of smooth muscle in brain capillaries is one of the factors involved in the development of ‘migraine’ headaches. Serotonin is thought to play a role in inflammation similar to that of histamine. 3) These are arginine, histidine, isoleucine, leucine, lysine, methionine, phenylalanine, threonine, tryptophan and valine. 4 ) When there is a vitamin B6 deficiency, tryptophan is converted to xanthurenic acid and excreted in the urine. Xanthurenic acid may damage the pancreas and may cause diabetes. It is also a carcinogenic substance. Xanthurenic acid in the urine indicates a vitamin B6 deficiency. There is anecdotal evidence that B6 deficiency is indicated when people cannot remember their dreams, as is common among drug addicts. This is thought to be due to B6 being used up in detoxification. 5 ) Doctors prescribe antidepressant drugs, called Specific Serotonin Reuptake Inhibitors (SSRIs) to artificially increase serotonin levels in depression. 7 ) Plasma tyrosine, phenylalanine, leucine, isoleucine and valine, being large neutral amino acids – unlike tryptophan – are affected by insulin and are consequently absorbed, leaving free the absorption of tryptophan. 8 ) This supports the concept of insulin resistance failing to absorb amino acids (including phenylalanine) by cells, which are then excreted in the urine, along with glucose, typical in diabetes. 9 ) Glutamic acid is a brain fuel. It cannot pass the blood brain barrier, but it is easily converted to glutamine, which can. When glutamic acid combines with ammonia – a nitrogenous by-product of amino acids and toxic to the brain – it becomes glutamine. Ammonia is then converted to urea and excreted via the urine. Glutamine is said to improve intelligence, control alcoholism, sugar craving, heal ulcers, alleviate fatigue, impotence, depression, and may be useful in schizophrenia and senility. 10 ) Just recently it has been announced that the consumption of kola ‘soft’ drinks – the popular high sugar drinks of young people – has been increased by 7 per cent in the last six months of the year 2001. The fact that they may contain aspartame may aggravate the impact on their behaviour. 11 ) Some of the vitamins and minerals suggested are, Vitamin C (up to tolerance level +/- 3000 mg (Drug addicts can tolerate high doses of vitamin C), zinc, chromium (picolinate), selenium, B-Complex, vitamin B6, B12, folate and herbals supporting the liver: Dandelion, St Mary’s Thistle, Gentian, Fringe Tree, Greater Celandine, Withania (for anxiety) and many more. This should be put in front of our so call leaders and demand that this research into sugar and the toxic affects be actioned. Australia spends billions for hospital medicines for the health and wellbeing of our community. $32 Billion every year spent on health care for people who have diseases caused by sugar. The only thing it is good for is fueling our cars and the Govt can’t even do that. Is there more info available on the question, and where found? Cravings for drugs can be ameliorated with . If you score high it may be an indication that by ou are hypoglycemic.